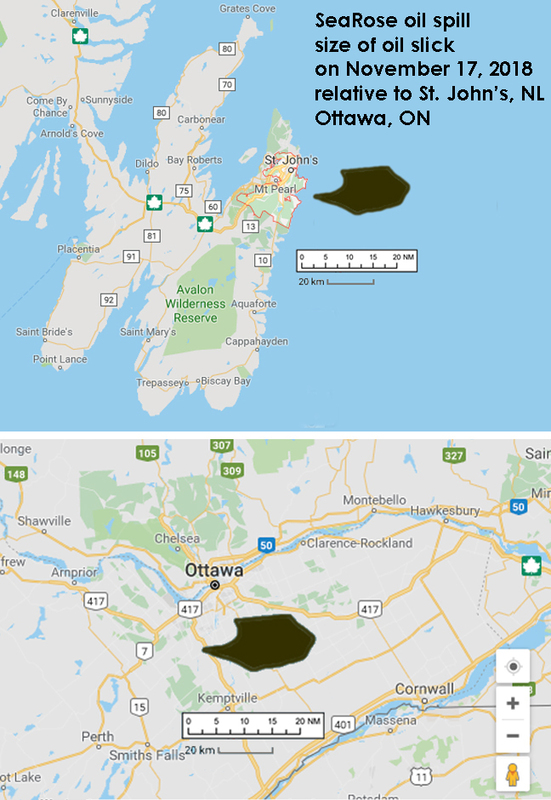 On November 16, 2018, in the afternoon, Husky Energy reported a spill of 'an estimated 250,000 litres' of crude oil from their SeaRose FPSO off the SE coast of Newfoundland (cbc story) (vocm story). 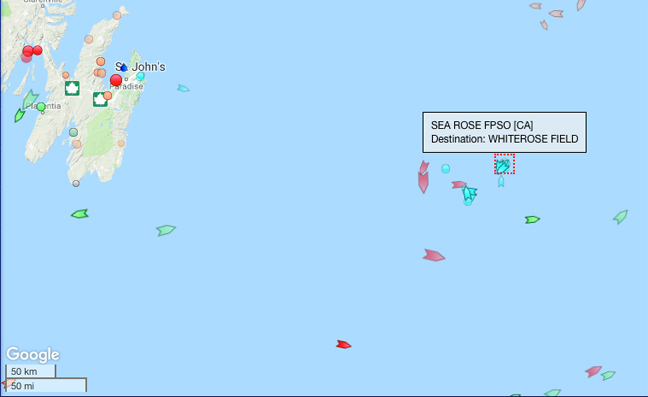 "The leak, from a flowline to the SeaRose FPSO, a vessel stationed about 350 kilometres off the Newfoundland coast, happened around mid-day on Friday in the White Rose field while crews were preparing to restart production." The spill area is frequented by hundreds of thousands of seabirds that are moving through in November, mostly Thick-billed and Common Murres and Dovekies (a October 28, 2018 boat run report may roughly indicate the species and proportions of seabirds affected). The expected seabird mortality from such a spill could likely number from hundreds of birds, to tens of thousands, or even hundreds of thousands. 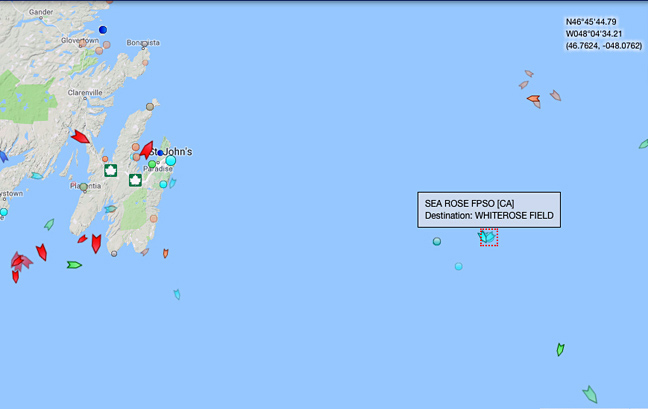 SeaRose was located about 350 km east of St. John's NL in the 'white rose' oilfield at the time of the reported spill. 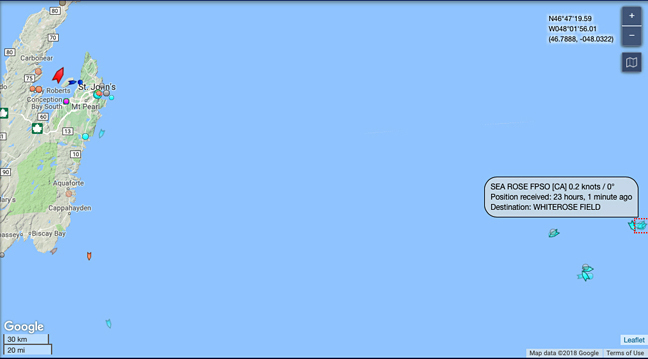 Activity in the area can be monitored via Marine Traffic: Global Ship Tracking Intelligence (click image below to view more or less live updates) n.b., this web page is slow, the FPSO has recently been re-labeled as 'unspecified ship' (gray dot) go figure. 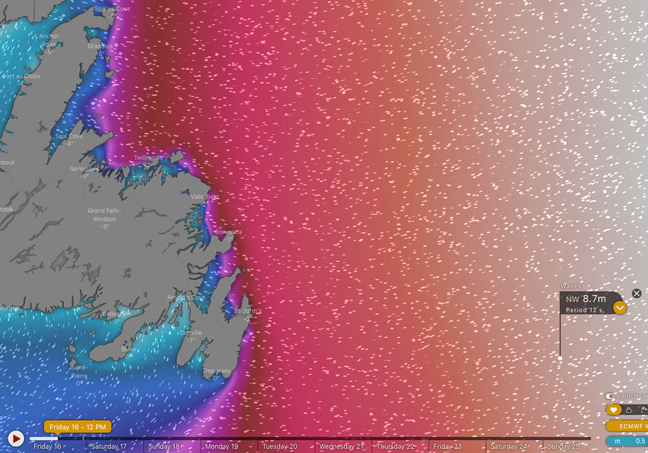 This event bears similarities to a previous crude oil spill in the Newfoundland offshore, the Terra Nova Oil Spill of November 21, 2004, about which more information can be retrieved here. Previous attempts by ilj to investigate a crude oil spill (Tuesday September 9, 2008) from the SeaRose FPSO were a fail (details here). A 250,000 litre crude oil spill reported in the media (cbc story) (vocm story) as occurring 'while crews were preparing to restart production' (presumably after a halt during stormy weather Wednesday and Thursday November 15-16) and resulting from a leak in the crude flowline (CNLOPB press release). The reports indicate the flowline could not be examined to check for an ongoing leak due to rough seas. No Canadian Coast Guard ships are responding to the oil spill - CCGS Sir Wilfred Grenfell remains moored to the wharf in St. John's. Environment Canada, that supposedly manages migratory birds and ocean pollution, has not released a statement or provided any media interviews. 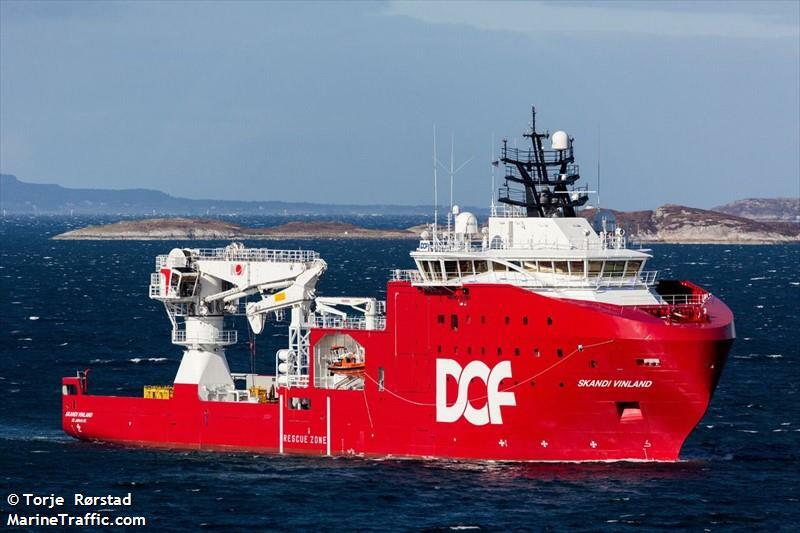 Reports (cbc) suggest the MV Skandi Vinland, an offshore supply vessel, 'has been sent' by Husky Energy to deploy remote-controlled vehicles to check whether the SeaRoseFPSO's flowline is secure or intact, but only when the sea height subsides to four metres or less. 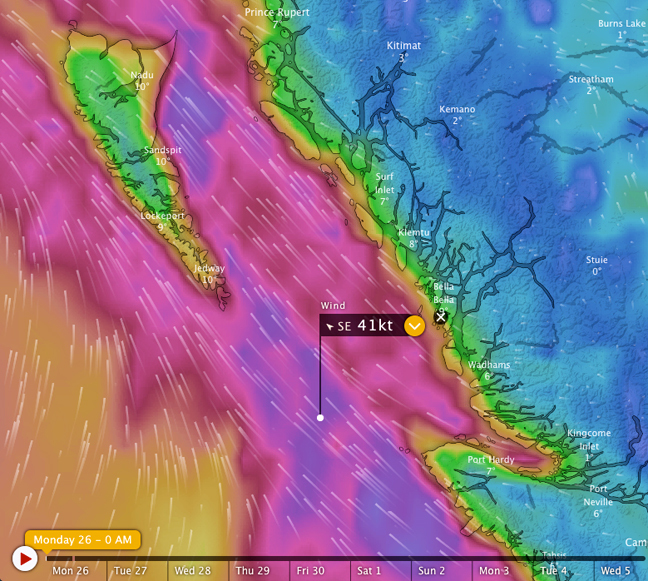 The Windy wind-wave model indicates this may occur late Monday (November 19) night, 3.5 days after the spill began. 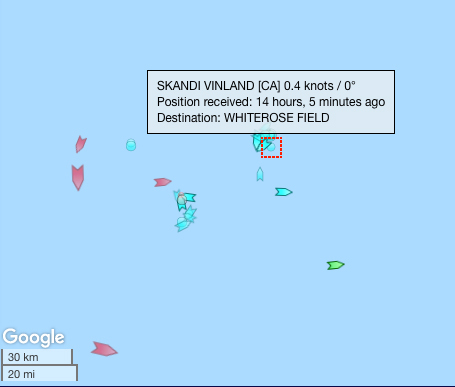 At 1700h Saturday marinetraffic.com is indicating Skandi Vinland is still moored to the wharf in St. John's. 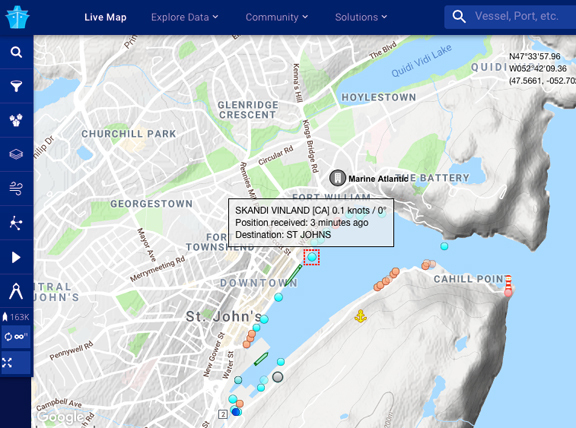 Skandi Vinland left the port of St. John's at about midnight 17-18 November and is said (cbc story) to have arrived in the oil field Sunday night with wildlife observers on board. This would permit seabird observations to begin Monday morning (68 hours, 2.5 days after the spill event). 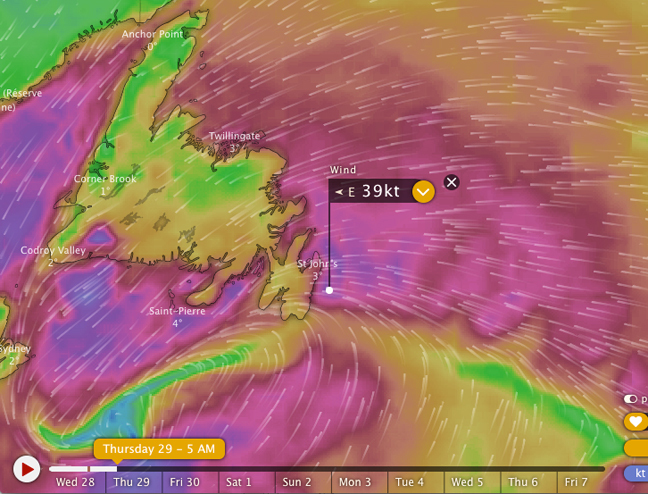 Sheen was reported 50 km south of the 'white rose' oilfield today, which is consistent with the gale force northwest winds at the time of the spill at the FPSO on Friday 16 November (the crude oil drifts downwind, and moves with ocean current). This reported sheen could represent the oil spill mass, which poses a grave risk to seabirds and requires careful surveillance. However, Skandi Vinland is tasked with operating ROVs to inspect the broken flowline at the SeaRose FPSO (cbc story), so it is unclear how the wildlife observers on board that vessel could make observations at the drifting oil, although they could make observations at the FPSO with its possibly leaking flowline (Husky has been unable to determine whether the flowline has stopped leaking, cbc story). 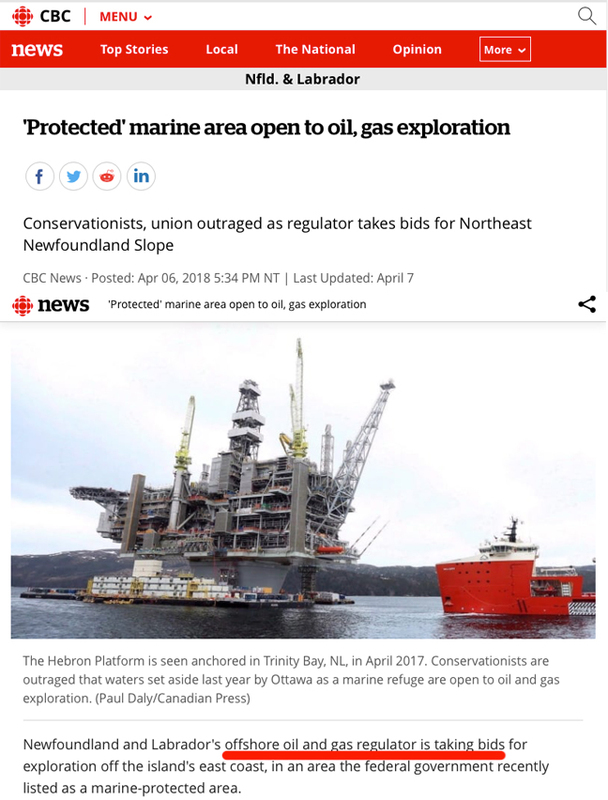 Meanwhile, the 'regulator' CNLOPB is reported to have temporarily shut down (some) Newfoundland and Labrador offshore facilities 'as a safety precaution' (cbc story). 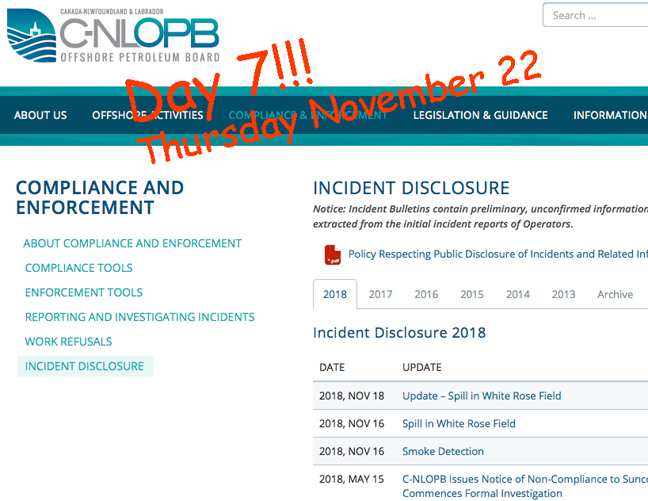 It is unclear when this ordered shut down actually began (November 14, 15, 16, 17 or 18) or when it will end and it is unclear why Husky personnel would have been 'preparing to restart production' (cbc story) on Friday November 16 if CNLOPB 'had suspended operations just before bad weather hit' (cbc story). CNLOPB issued its second press release containing minimal factual information about the spill today, beginning with the text 'Thanks to the efforts of many, there have been no reports of workers getting hurt during last week’s storm...', continuing the promotional public relations stance this organization normally follows in news releases. The headline 'Weather still preventing Husky from cleaning up spill of 250,000 litres of crude' (cbc story) would appear to underestimate (by omission) the challenges in recovering any spilled oil in the Newfoundland offshore in November. 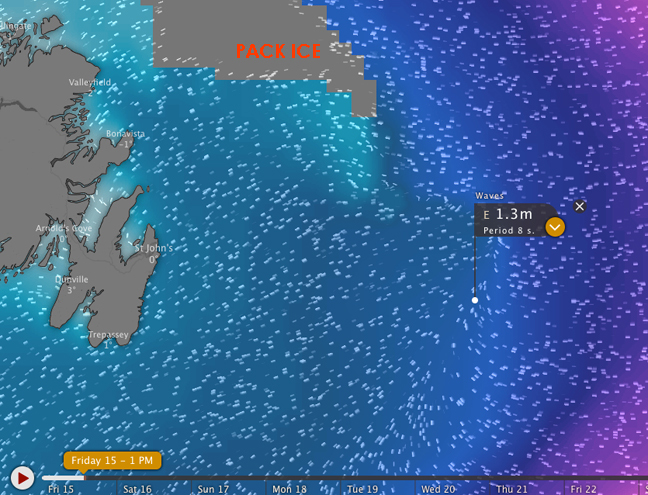 We still have minimal information about what is going on in the Newfoundland offshore related to this major oil spill. Reports indicate that seabird observers on more than one vessel may be making wildlife observations and that four or five oiled birds (species not identified) have been found (cbc story), while the NL Environment Minister is quoted as saying aircraft did not locate any areas of 'sheen' in searches today (cbc story), or possibly 'new areas of sheen'. Yesterday's report of sheen 50 km south of the FPSO suggest the bulk of the spilled crude oil could now be far from the spill site (72+ hours after the spill) - but maybe not - see below. 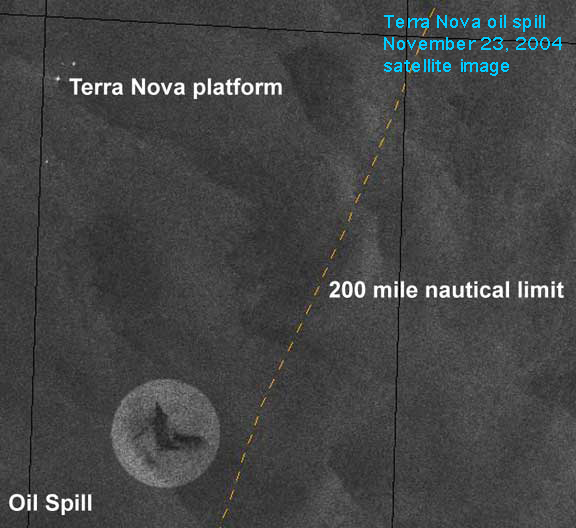 Satellite imagery, available for the November 2004 Terra Nova spill, was instructive about the location and movement of the oil (see below) - is it available for this spill? We don't know. 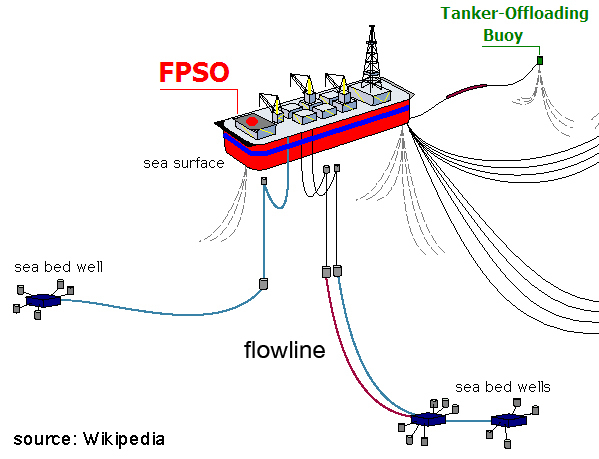 A major unknown is the location of the leak in the FPSO's flowline, whether it was near the sea surface close to the FPSO (temperature c.4 degrees C) or near the bottom (temperature near freezing 0 degrees C), and also whether this leak continues - this will be looked in to with ROVs, unclear when (cbc story). If crude oil was released near the sea floor, this could have significant effects on the viscosity and movement of the crude oil towards the ocean surface (delayed) and its subsequent threat to seabirds and detectability (delayed). 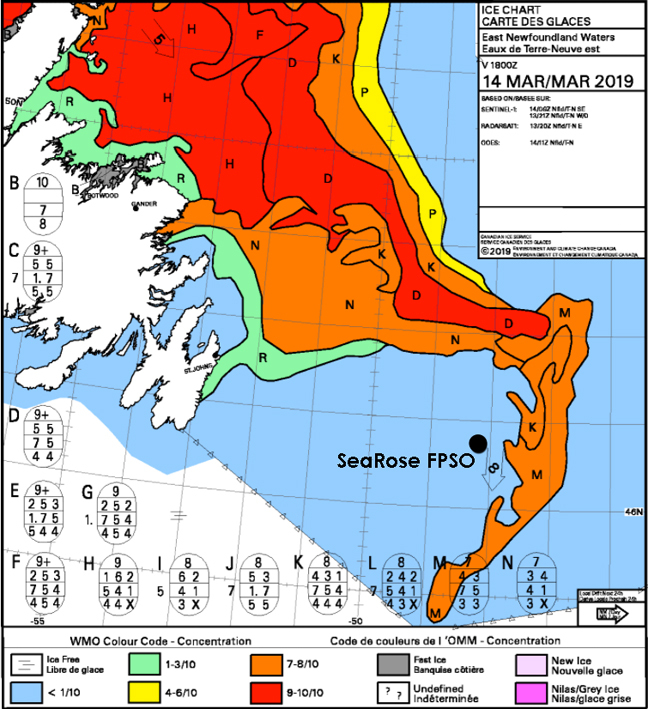 CNLOPB's Scott Tessier said that seas were at 8.4 meters when the flowpipe reconnection was attempted at SeaRose (cbc story). 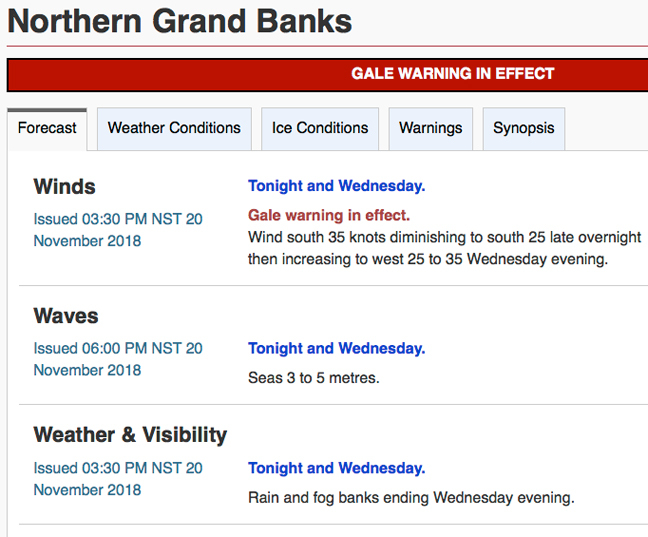 CNLOPB, the offshore oil 'regulator', did not order the closure of all offshore oil activities until after the SeaRose spill occurred and after last week's Wednesday-Thursday storm had subsided, but now say operations will be suspended until 'it is safe'. Questions as to why Husky Energy proceeded to reconnect the flowline on Friday in rough seas are being asked (vocm story) and also why CNLOPB did not order an oil field wide shut down in conditions this organization in hindsight has claimed were 'the worst this region has seen offshore since the Ocean Ranger disaster in 1982'SIC (CNLOPB November 18 press release). Husky Energy is refusing requests for media interviews (cbc story). Environment Canada, that supposedly leads migratory bird management and enforcement including birds oiled at sea has as usual also remained silent on this major oil spill. "The accidental oil spill from the Terra Nova platform off the coast of Newfoundland can be seen in this RADARSAT-1 image acquired November 23, 2004. The image was acquired for the Government of Canada's Integrated SatelliteTracking of Polluters (ISTOP) program, which monitors accidental and illegal oil spills from space to help protect the environment. RADARSAT-1 data © Canadian Space Agency/Agence spatiale canadienne 2004. Received by the Canada Centre for Remote Sensing. Processed and distributed by RADARSAT International." A severe lack of information about all aspects of this major offshore crude oil spill continues. No briefing by the wildlife response team leader has been provided. 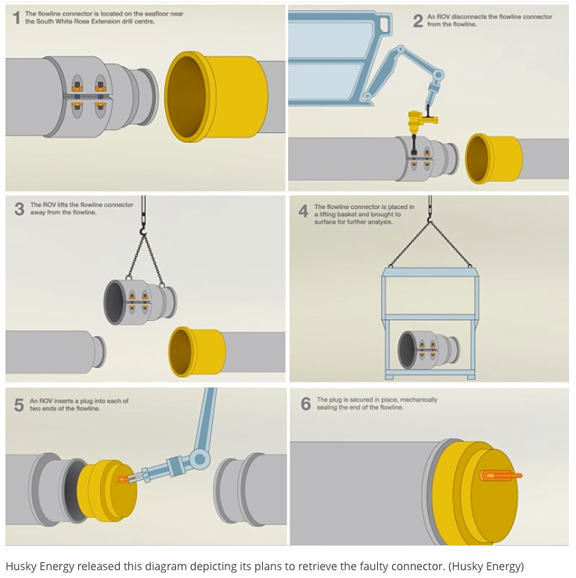 Husky Energy is reported to have stated that the oil spill was caused by a faulty valve in the flow line (cbc story). 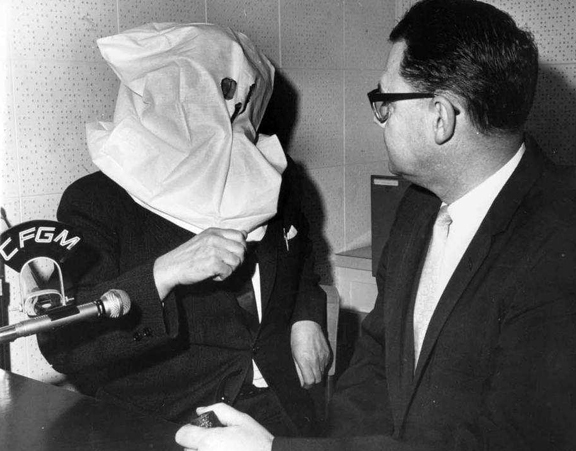 Political recriminations are escalating in St. John's (cbc story) (another cbc story). 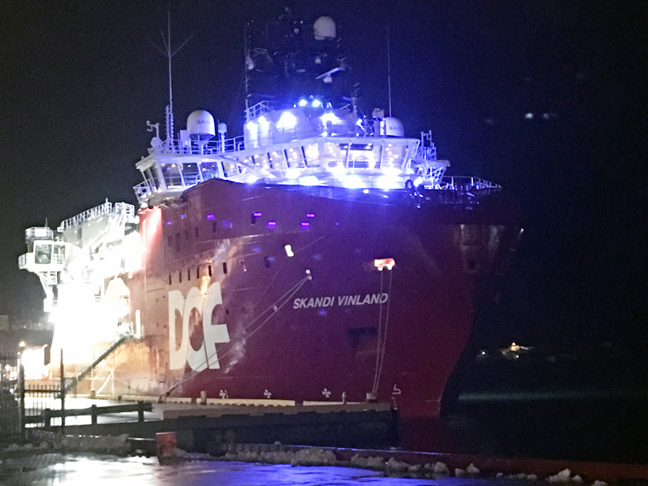 Offshore supply vessels, including Skandi Vinland, were tightly clustered around the shut down SeaRose FPSO Tuesday evening (Marine Traffic intel). Regarding marine bird science, it is unclear whether drift blocks (used to measure carcass detection rate) have been deployed to obtain a rigorous measure of seabird mortality in this massive crude oil spill. 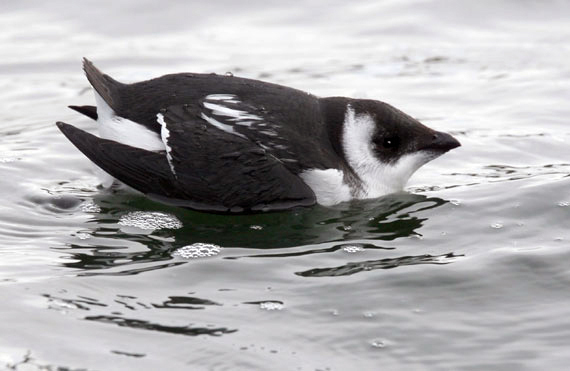 Yesterday the responsible party (Husky Energy) in a press release stated that fourteen oiled seabirds [species not specified] were observed and three recovered. Without a measurement of oiled bird detection rate, it will be difficult to make a scientifically defendable quantitative measurement of mortality for the SeaRose spill. so how do we measure seabird carcass detection rate? we deploy a known number of drift blocks in the spill area - the drift blocks float just like a dead seabird - we then search the spill area for seabird carcasses AND drift blocks and tally both so, for example, suppose we throw out 1000 drift blocks in the spill area, and in our search we retrieve 3 blocks and 14 seabird carcasses... the detection rate is 3/1000 = 0.003 the estimate of mortality is 14 x 1/0.003 = 4,667 birds The drift blocks (n > 1000) must be deployed promptly when the spill begins. The drift blocks must be deployed throughout the spill area in a representative manner. The search must begin soon after the spill begins and focus equally on retrieving carcasses and drift blocks. Drift blocks were apparently available on the Terra Nova FPSO at the time of the November 21, 2004 spill, but were not deployed promptly, severely hampering attempts to estimate mortality in that spill. If SeaRose/Husky Energy had been appropriately prepared to measure an oil spill at their facility, drift blocks would have been available and deployed on Friday November 16. Reference: Wiese, F.K. and I.L. Jones. 2001. 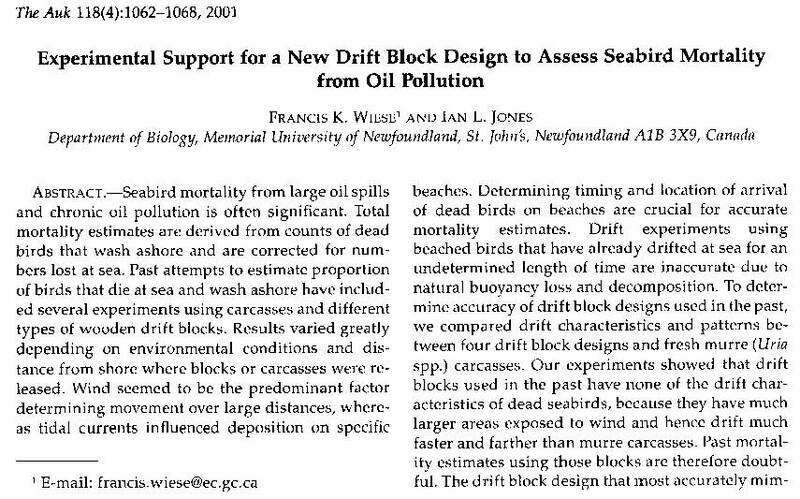 Experimental support for a new drift block design to assess seabird mortality from oil pollution. Auk 118(4): 1062-1068. Listen here for today's response from Environment Canada's head office in Ottawa to this major crude oil spill! The responsible party's inability to identify oiled and dead birds in the hand casts doubt on their ability to conduct a scientific evaluation of spill damage. Oil spill response and analysis involves a complex terminology that many people are unfamiliar with. To assist, I have provided a Newfoundland oil spill glossary here. Infographic! "Regulatory capture: a form of government failure which occurs when a regulatory agency, created to act in the public interest, instead advances the commercial or political concerns of special interest groups that dominate the industry or sector it is charged with regulating. When regulatory capture occurs, the interests of firms or political groups are prioritized over the interests of the public, leading to a net loss for society. Government agencies suffering regulatory capture are called "captured agencies"." (wikipedia) I had never heard of this term until Robert Wells politely explained it to me. In December 2016, St. John's based Environment Canada employees, following up on criticisms related to the poor response to the November 2004 Terra Nova oil spill, conducted a large scale ship-based multi-day experiment on the ocean off the east side of the Avalon peninsula, Newfoundland to measure the detection rate and properties of seabird carcasses and drift blocks (see above comments for 'Day 6'). More than one thousand drift blocks and seabird carcasses were placed in the sea, some fitted with tracking devices so their drift could be followed in real time, the biggest ever experiment to look in to seabird carcass drift and mortality estimation for application to offshore oil spills similar to the SeaRose crude oil spill. Ship transects were undertaken to search the trajectory of the drifting objects, with sea conditions during the experiment mostly moderate. Resighting of drift blocks and carcasses was extremely low, even though their location was known. Nearly two years later, the results and even the existence of this study has not been publicly disclosed or published in the appropriate peer-reviewed scientific literature - even though its results would appear to be crucial today. Lack of discussion by Environment Canada scientists at this time is consistent with the notion that they remain 'muzzled'. 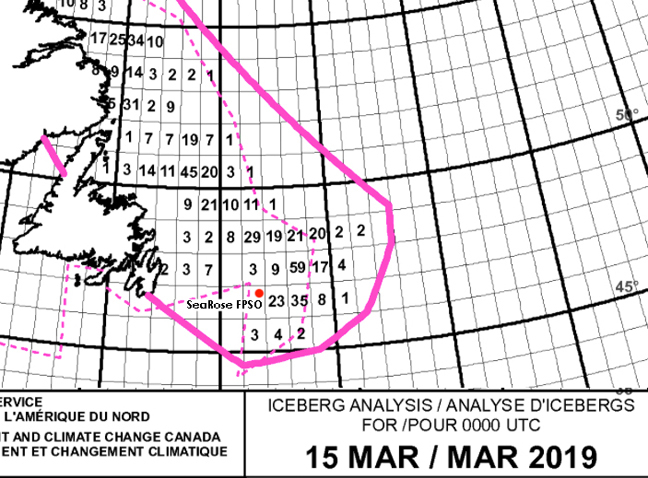 A failure of Environment Canada to publicly show up for this major offshore crude oil spill is consistent with current government policy of promoting the oil industry, never mind what. Meanwhile in the offshore, weather conditions remain normal for this time of year (i.e., extremely harsh and not condusive to measuring oil spill damage). A total of 18 'impacted wildlife' are said to have been observed, all four living oiled birds (3 'petrels'SIC and 1 murre) returned by helicopter to the 'rehabilitation centre' in St. John's are dead, as expected. 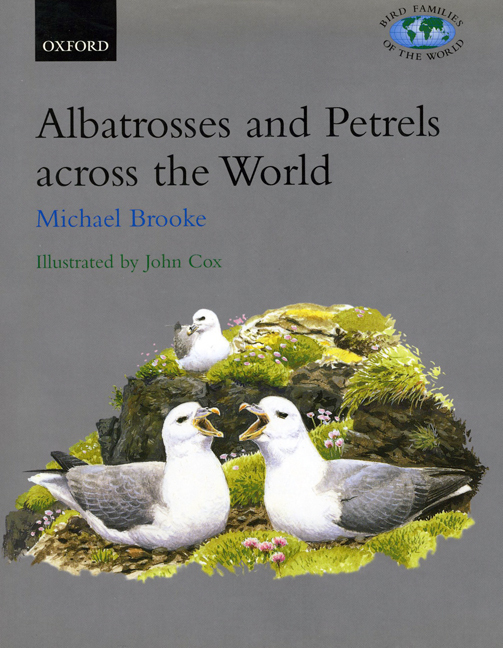 The three 'petrels' reported are presumably Leach's Storm-petrels (n.b., 'petrel' is a generic term that can refer to a variety of members of three different families in the avian Order Procellariiformes - Leach's Storm-petrel is a 'storm-petrel', family Hydrobatidae). It is unclear whether the storm-petrels were recovered oiled from the sea or alternatively if they collided with spill-response vessels due to light attraction. No observation flights of the spill zone have taken place since November 23 (Friday), although four vessels are reported to be 'observing on-water'. 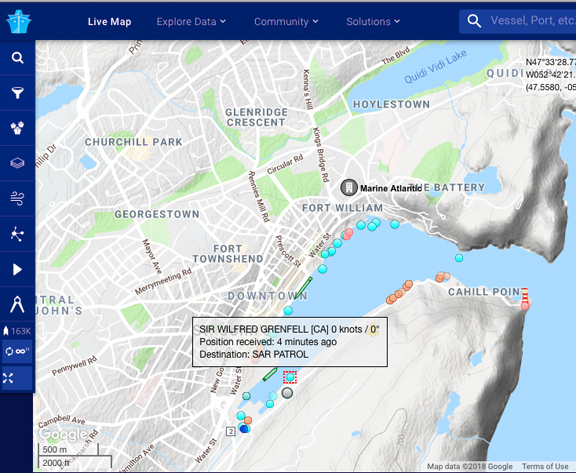 Husky Energy is running the same report as for Sunday today, except that an additional vessel is now reported to be doing on-water observations, making the total now 5 vessels observing. This is a encouraging number of vessels said to be responding - hopefully they are engaged in a drift-block study to measure seabird mortality resulting from the crude oil spill. As of day 11, no briefing by the wildlife response team leader has been provided, so we have pretty much no idea what is going on offshore in relation to science. 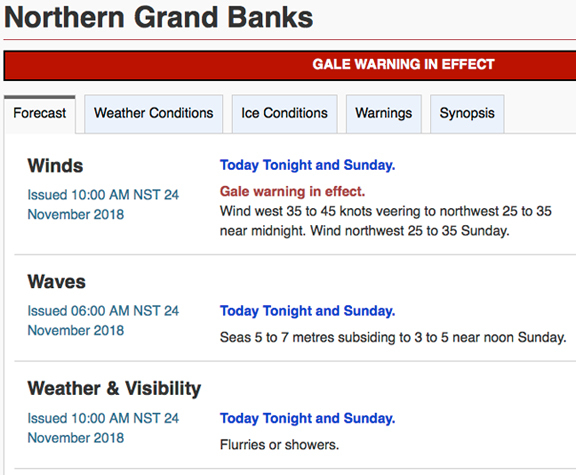 Forecast weather conditions got better today on the northern Grand Banks of Newfoundland, with winds north 15 to 20 knots and seas 3 to 5 metres subsiding to 2 to 3 this afternoon. It was windy in Queen Charlotte Sound overnight, hope everything is OK there. Husky Energy's updated press release appears to indicate an aircraft flew over the spill zone today, bringing the total number of overflights to eleven, with five vessels said to be still 'observing on-water'. Technical issues are delaying the recovery of the broken flowline connector, that has not been brought to the surface because is may still contain crude oil (vocm story). Seabirds (said to be 'murres' and 'petrels') picked up and brought back to town continue to die in captivity. Dovekies, that are likely to be abundant in the spill zone, have not been mentioned. Apart from these brief repetitive communications from the responsible party for this massive offshore crude oil spill, no other information concerning seabird impacts has been released to the public as of today. Husky Energy's updated press release claims six vessels are 'observing on-water' today (one more than yesterday) - this is encouraging, because it is consistent with an ongoing concerted effort being made to measure impact of the crude oil spill on seabirds via ship transects in the spill area (to record oiled wildlife and drift-blocks). Unfortunately, because no information has been forthcoming from the wildlife response team leader or anyone else in command of spill response due to the ongoing media blackout, we still have pretty much no idea what is actually going on out there re science. The total number of 'impacted' seabirds said to have been observed remains at 18, where it has been since Friday November 23. 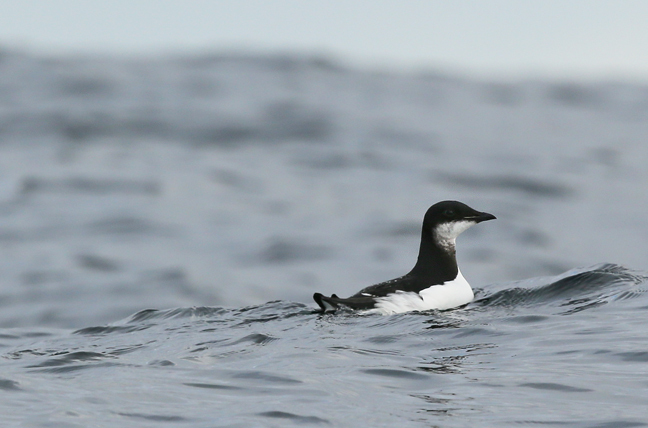 We have not been told what species 10/18 of these are - are they murres? Dovekies? Atlantic Puffins? Apparently this information is too sensitive for the public to be informed about. Furthermore, Marine Traffic Intelligence is not showing 'six' vessels in locations likely to be of interest (possibly they have shut off their satellite transponders). Are these 'observing on-water' vessels even anywhere near expected locations of oiled seabirds and drifting oil? We don't know. Conditions offshore are likely to be tough on bird observers and oiled wildlife tonight through Friday. 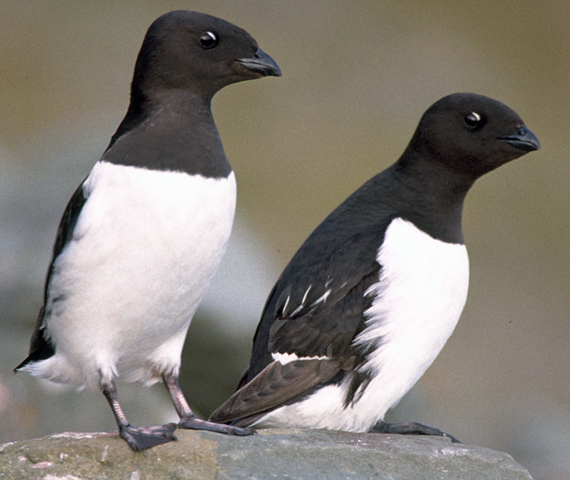 Big winds from the east tonight (the first since the spill occurred) might possibly bring oiled but still flight-capable seabirds to land on the Avalon Peninsula by tomorrow - I will be looking for these. An article published first thing this morning reveals some interesting information: "There have been several survey flights and wildlife observers are on the five vessels alongside the SeaRose, said Dr. Sabina Wilhelm, a seabird biologist with the Canadian Wildlife Service who is coordinating the monitoring. Offshore, a grid comprised of 50 affected areas has been developed to allow observers to collect baseline densities of sea birds. 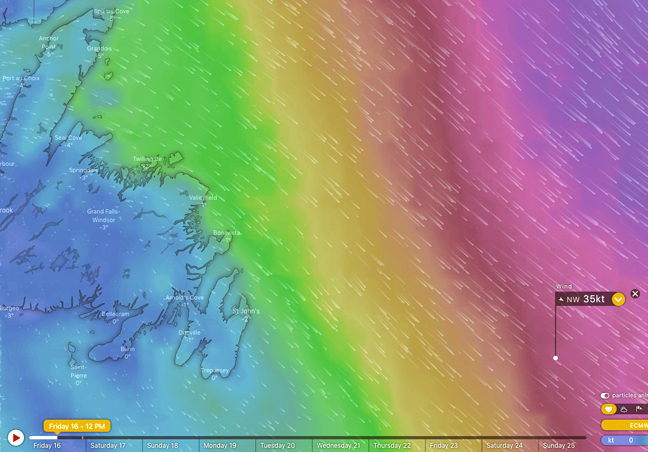 Wilhelm said they receive the raw data every day, which determines where the next day’s surveys will be done." 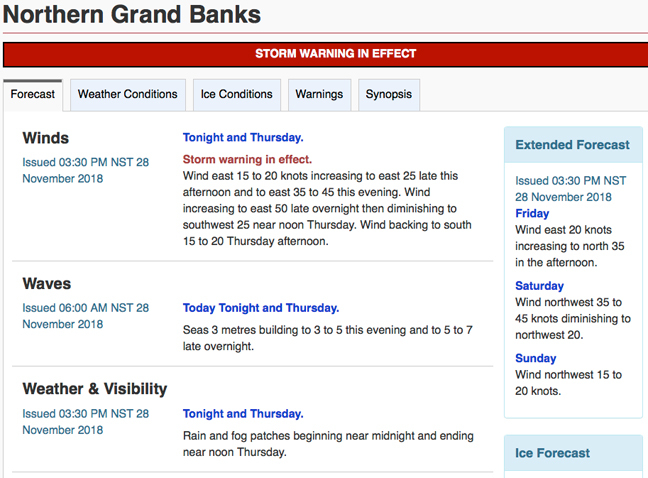 This is the first information we have linking Environment Canada (of which the Canadian Wildlife Service was formerly a component) to spill response. A drift block approach is not mentioned. 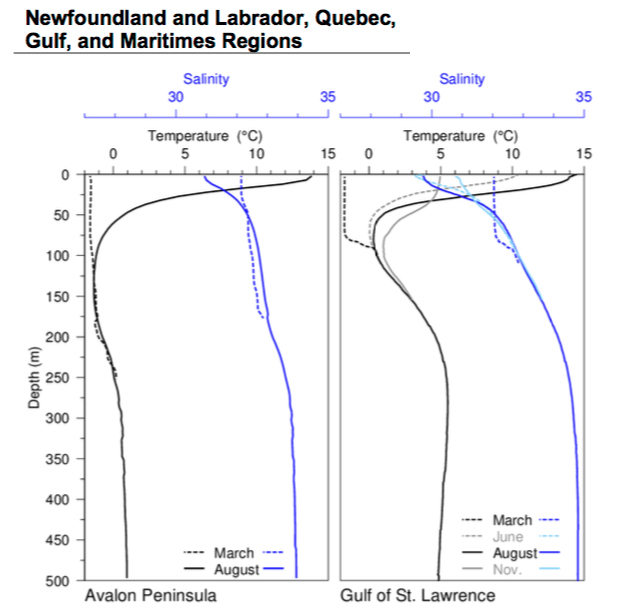 We may infer some form of modelling of bird density in relation to the trajectory of the oil spill is in play. It looks like a significant ship-based project to make bird observations was underway - encouraging news. These ship-based observations ended today (day 14) according to Husky Energy. Unfortunately, without an organized protocol for full, transparent and timely release of information to the public we are in a situation of government- and oil industry-enforced ignorance about response to a catastrophic offshore crude oil spill. This situation, fourteen years after the infamous Terra Nova oil spill, is indicative of an ongoing complete failure to achieve appropriate public regulation of offshore oil extraction activity in Canada. Two weeks after the largest offshore crude oil spill in the history of Newfoundland, the lead agency for environmental protection in the Newfoundland offshore, the CNLOPB, has released no meaningful information about impacts of the spill on wildlife or measures being taken to measure damage. The responsible party for the oil spill, Husky Energy, has uploaded a series of (mostly self-repeating) uninformative updates. Dr. Sabina Wilhelm, a seabird biologist with the Canadian Wildlife Service (Environment Canada) has given media interviews and provided some brief but helpful information about spill response. Crucial (but elementary) questions about what is going on still include: What species of seabird have been observed oiled? What seabirds (all birds) have been observed in the spill area? 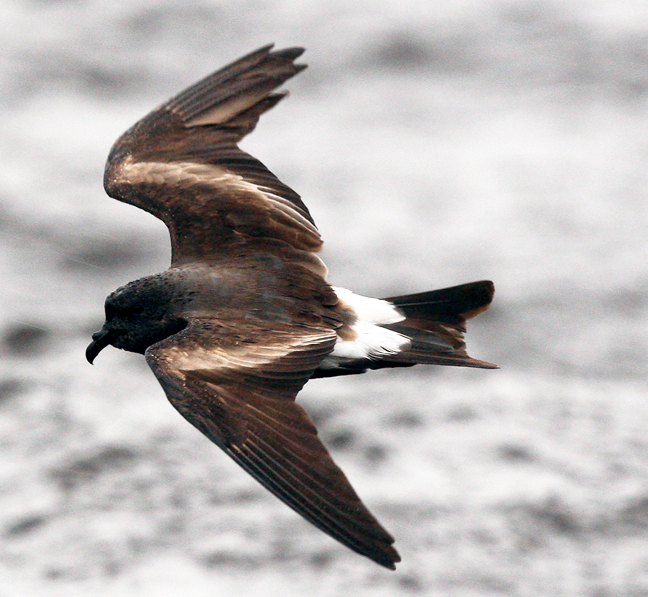 Were the Leach's Storm-petrels collected killed by crude oil or light attraction? Were drift blocks, designed to empirically measure oil spill mortality, deployed during the spill event? (and if not why not?) What is the rationale and design of ongoing ship-based surveys to assess damage? What exactly are these surveys intended to measure? Will these surveys be adequate to provide a scientific estimate of seabird mortality related to the oil spill? How does the regulator intend to force the responsible party to repair damage to seabird populations resulting from the spill? It seems incredible to me that the public has not been informed in detail by the lead agency about this (and more) basic information related to a catastrophic oil spill. A repeat failure is indicated. 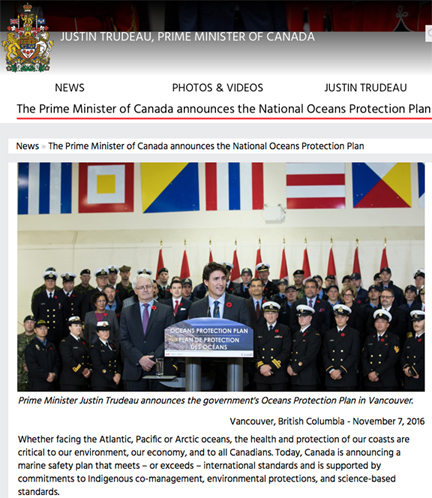 Even worse, our experience of coordinated governmental and industrial secrecy in the SeaRose oil spill makes a mockery of the mendacious and propagandistic claims made for the Canadian federal government's so-called Oceans Protection Plan. A well-organized coverup continues... Radarsat images of the oil spill have not been released. 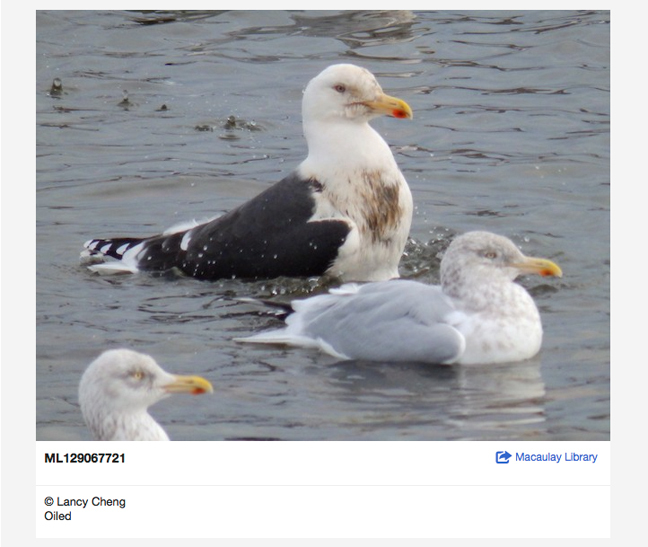 Images of seabirds oiled have not been released. Oil spill photographs have not been released. A bird species list of affected birds has not been released. Outline descriptions of post-spill surveys, their rationale, and their results have not been released. The responsible party for the oil spill, Husky Energy, retains full information control over this tragic event. iPolitics said on Thursday: "The spill has become an “out of sight, out of mind” PR home run for Husky [Energy].". CNLOPB has still not released or discussed any significant factual information related to the oil spill environmental damage - except they say Husky Energy has indeed been using satellite monitoring to make observations of their spill zone (keep in mind this is the largest offshore crude oil spill in Newfoundland history). 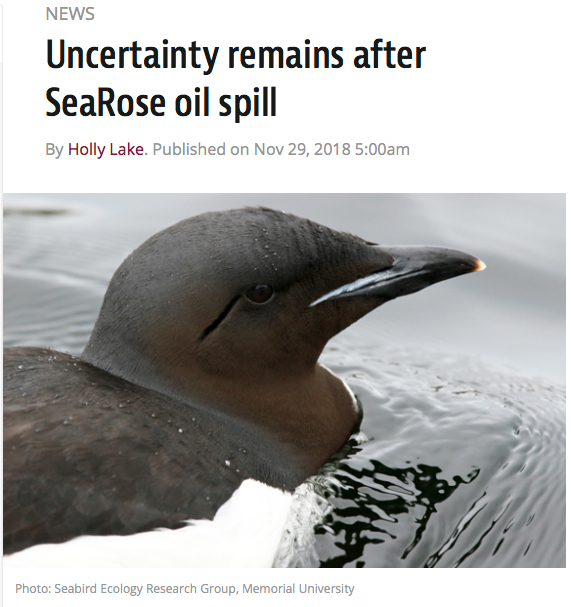 Husky Energy's web page says one overflight of the spill zone took place during the last week, that two Thick-billed Murres were released 50 km offshore after rehabilitation and that an oiled murre (species not disclosed) landed on supply vessel Atlantic Heron on December 4 (day 19) and was brought to town for treatment. This may indicate that large numbers of oiled seabirds are still flying around out there (too bad ship-based observation surveys stopped on day 14). Nevertheless, chemical analysis of the oil on this bird is urgently required to indicate whether the oil is: 1) SeaRose crude oil from the Novevember 16 spill, 2) crude oil from an unreported different offshore spill, or 3) bilge (Bunker C) ship fuel oil from a different unreported spill. Each and all of these possibilities have crucial implications for investigation of the SeaRose crude oil spill. Failure to collect and analyze this oil could create the impression that vital evidence about the SeaRose spill is being 'lost' again. The careful analysis and disclosure of these results is a test of whether the SeaRose spill investigation is legitimate or dubious (as was the case for the November 2004 Terra Nova oil spill). 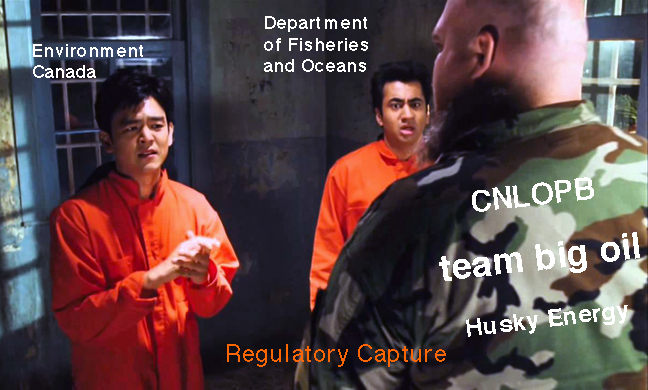 Husky Energy says: "We will cooperate fully with the C-NLOPB and other regulatory authorities, to ensure government, other offshore operations, and the public are kept informed." The oil industry concept of the word 'informed' appears to be quite narrow. 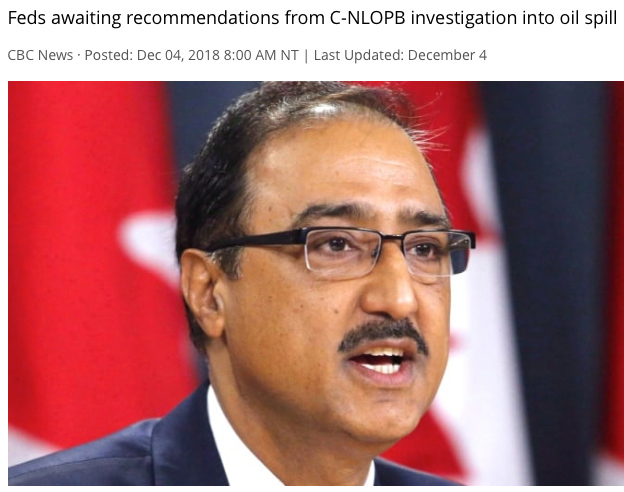 On Tuesday (Dec 4) Canadian Federal government Natural Resources Minister Amarjeet Sohi said "I have full confidence in the Canada-Newfoundland Labrador Offshore Petroleum Board to conduct this investigation and we will follow up on the recommendations. 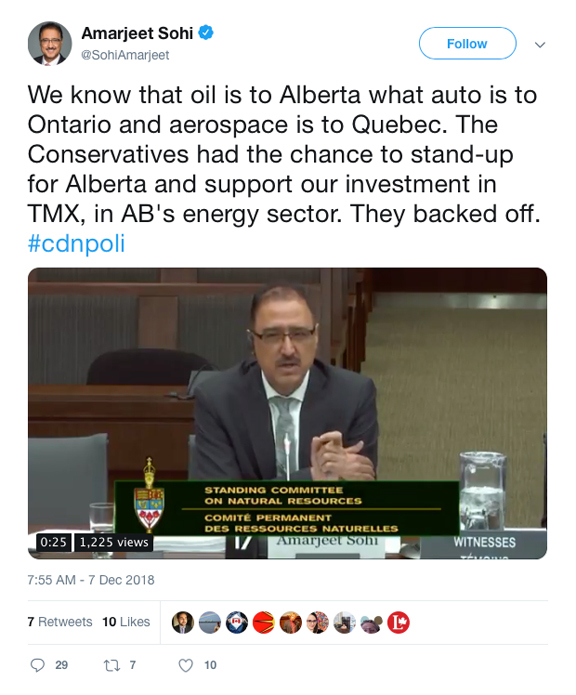 "(cbc story) (i.e., the Minister of Natural Resources is deferring to an offshore oil industry-controlled propaganda agency to advise on the SeaRose spill, c.f., Regulatory capture definition, above). As for the September 2008 SeaRose oil spill a coordinated blackout of spill information is in place, involving the responsible party, CNLOPB and the Canadian Federal Government. 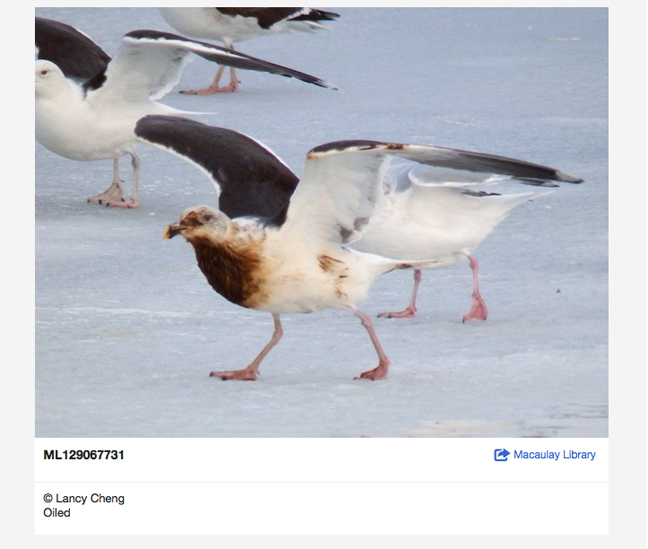 Two oiled Great Black-backed Gulls were photographed at Quidi Vidi Lake, St. John's on Saturday December 15 (day 30) - the source of the oil on these birds is unknown. One 'badly-oiled' Iceland Gull was observed at the Robin Hood Bay Landfill site, St. John's on Sunday December 16 (day 31) - n.b., sightings of oiled birds are not rare in the St. John's area, most likely relate to small local industrial spills/dumps of Bunker C. Nevertheless, it would be useful to sample this oil to check for SeaRose crude oil. The origin of the heavy oil on these birds is unknown. Compared to recent years, these observations comprise a highly unusual December 'blip' of oiled bird observations around southeastern Newfoundland. It appears it is now legal to pollute Canadian marine waters with petroleum (see below). This has profound implications for oil spill response and enforcement of environmental laws in the Newfoundland offshore. 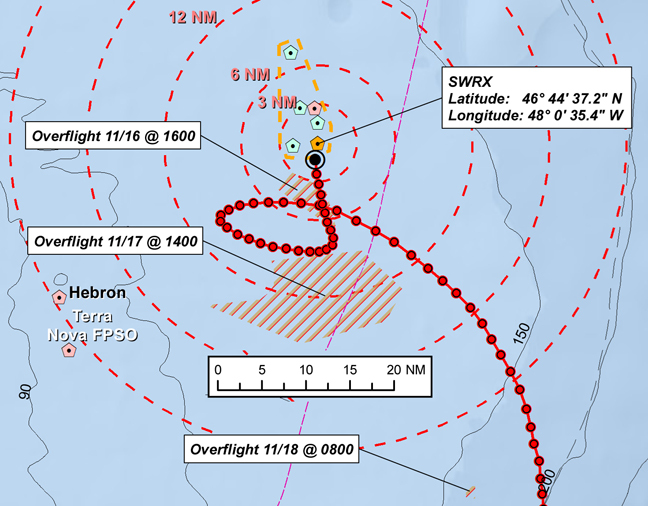 A cbc news story today revealed a previously undisclosed chart that indicates the size (area) of the massive crude oil spill on day 2 of the spill (November 17, 2018) supposedly based on an aircraft overflight (see below). 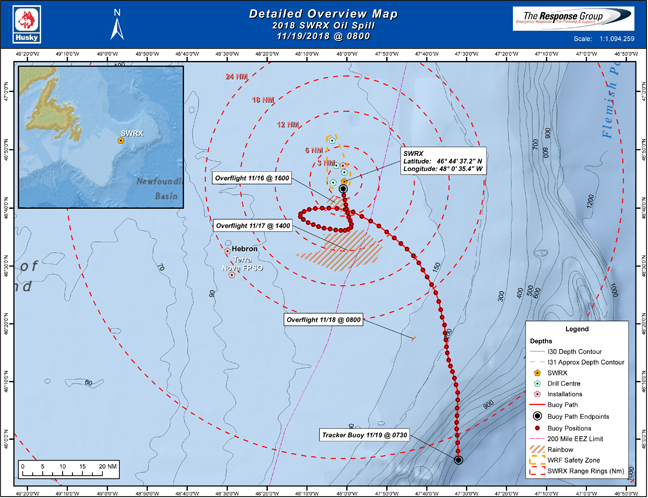 The chart seems to indicate a 21 nautical mile by 10 nautical mile (41 km by 19 km) oil slick. 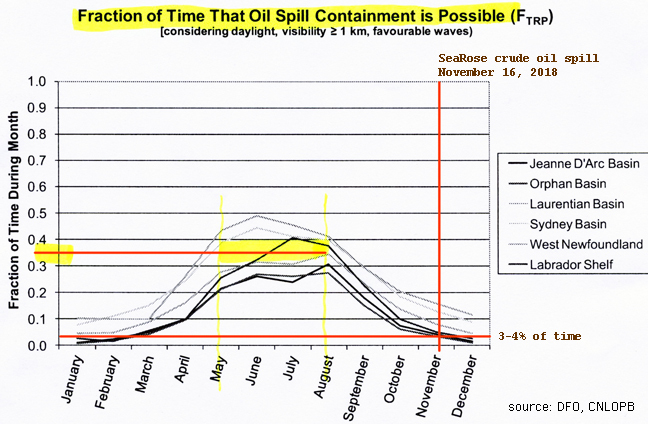 This chart, and discussion of its important contents was never evident in Husky (Husky posted a larger scale chart with no oil slicks on it) or CNLOPB's disclosure web pages in November 2018 - rather, the impression given was of minimal oil on the sea surface ('I infer that evidence of crude oil on the sea surface is sparce.' ilj November 20). 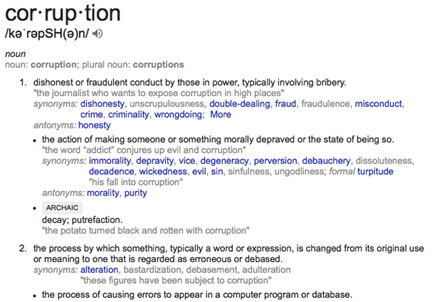 This may create the impression that crucial information about this oil spill was hidden from public scrutiny. 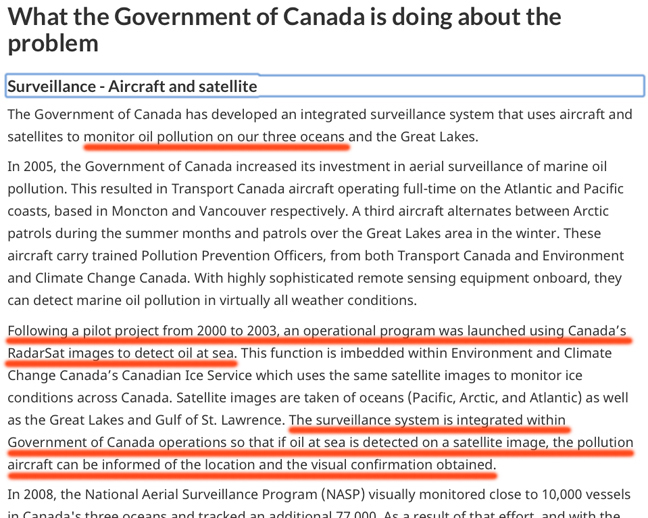 Environment Canada, that supposedly manages migratory birds including seabirds and is responsible for enforcement of bird protection laws, appears instead to have been colluding with Husky Energy in enforcing non-disclosure of oil spill information (cf. my notes on events of November 27-30, freedom of information requests pending) - this is consistent with their support for oil extraction never mind what and their credo 'the purpose of science is to support government policy'. What are we to make from the information contents of the chart? If correct, these indicate crude oil on the sea surface covering hundreds of square kilometres in the days after the spill - capable of killing hundreds of thousands of seabirds especially Dovekies and Thick-billed and Common Murres. Radarsat images, said by CNLOPB to be in Husky Energy's possession, would provide crucial information about the size of the slick and its movement during November 16-25 - but they have not been released for public scrutiny. Today's information underlines the suspicion that the extent and significance of the SeaRose crude oil spill are being covered up in a conspiracy involving the responsible party, the regulator, and the government agency in charge of enforcing Canadian marine pollution and migratory bird laws. A cbc news story today states that due to a window of calm weather, an operation to recover the decoupled flowline is underway. 'Around 7 a.m. NT Friday, Husky Energy sent a pair of remotely operated vehicles down into the sea to pick up the faulty connector it says was behind the spill.' Crude oil is believed to remain in the flowline, and may leak 'according to a Husky Energy spokesperson'. 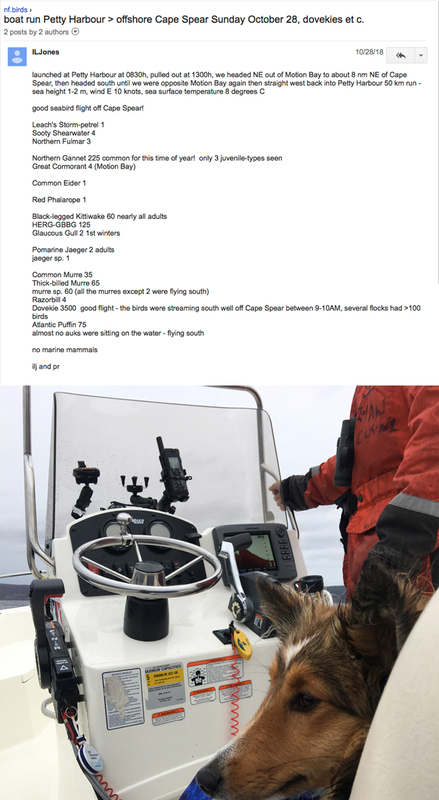 The story says the the Canadian Coast Guard is on site (the first evidence of actual CCG response to the November 16, 2018 crude oil spill). Husky has been waiting for a four-day stretch of good weather since January to recover the connector, presumably because cleanup of oil on the sea surface has been impossible for the last 44 days. Husky Energy is said to be in need of 'investigations to look at the detail of the weak link and determine the root cause as to why it might have failed' (i.e., the cause of the November 16 oil spill, that is currently unknown). 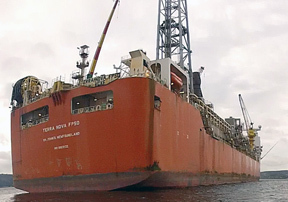 Meanwhile, 'SeaRose FPSO resumed production on Jan. 30, but just one of its five drill centres has been operational'. CNLOPB made a press release on March 13 describing some aspects of this operation, including the statement: 'Wildlife surveillance by qualified wildlife observers (for birds and marine mammals) is to be in place onboard each vessel authorized for the operation, and will be in regular contact with the CWS;' (i.e., personnel of the Canadian Wildlife Service of Environment Canada are not on scene, paid oil industry consultants are). 'A C-NLOPB Conservation Officer along with staff from the CCG and the ECRC are to be onboard authorized vessels to observe operations; '. It appears no person that can speak freely about what happens is observing this operation. 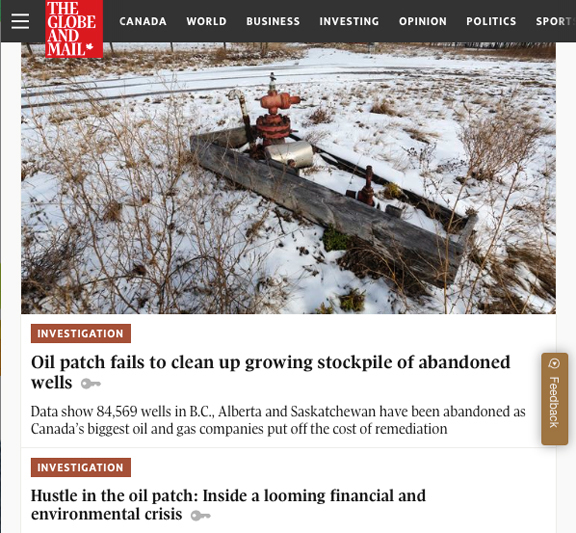 A cbc article indicates the operation to recover the faulty flowline connector was completed Tuesday March 19 (day 124), with the item to 'be brought in for forensic investigation to determine the cause of the failure that led to the oil spill.' and the open ends of the flowline finally plugged.